In 1945 and 1946, the conflict of World War II may have ended, but the US turbo jet program continued to take flight: during this time, the USAAF Air Materiel Command (AMC) spawned many new turbojet- or turboprop-jet-powered bomber and fighter programs in its never-ending quest to field superior combat aircraft. 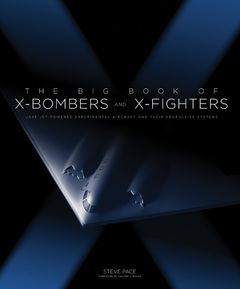 Steve Pace’s newest book, The Big Book of X-Bombers & X-Fighters, combines a historic bird’s-eye view with intricate ground-level detail of over 90 ASAF jet-powered X-bombers and X-fighters, including the Lockheed Aircraft Corporation XP/XF-90 and XF-90A. The Lockheed Aircraft Corporation XP/XF-90 offered direct competition to the McDonnell XP/XF-88 during the USAAF/USAF Penetration Fighter competition. The North American YF-93A was a late entry, but it also participated. Lockheed investigated numerous XP-90 configurations under several temporary design numbers (TDN), which included TDN L-153, L-167, and L-169. In the end, the TDN L-153 was built. Lockheed XP-90 proposal number one called for two afterburning, axial-flow, 4,900 lbf (with afterburning) Westinghouse XJ34-WE-32 US Navy-type turbojet engines. Number two (alternate) featured two afterburning, axial-flow, 6,100 lbf (with afterburning) Westinghouse XJ46-WE-2 USN-type turbojet engines. Neither of these engines was ever used. On April 11, 1946, Lockheed received teletype authorization to proceed with its long-range fighter program. On June 5, 1946, it received a letter contract to purchase two XP-90 airplanes under USAAF AMC Secret Project MX-812; USAAF contract number AC-14563. Lockheed offered its TDN L-169-1 design on December 20, 1946. A full-scale engineering XP-90 mockup was built, and the USAAF gave a preliminary inspection on June 1, 1947. The full and final USAAF 689 Engineering Board inspection of the XF-90 (as designated after June 11, 1948) mockup was completed in April 1949. Following the engineering inspection, the order for two XF-90 airplanes was finalized under USAAF AMC Secret Project MX-812; USAAF contract number AC-14563. Approved by the DOD on January 25, 1949, the planes had already been issued USAAF serial numbers 46-687 and 46-688. The estimated first flight date was June 1948. The first XF-90 (46-687) was taken up on its first flight on June 3, 1949. The second XF-90 (46-688) made its first flight at the newly named Edwards AFB in March 1950. Both XF-90 airplanes were redesignated XF-90A after they were refitted with afterburner-equipped, 4,200 lbf (with afterburning) J34-WE-15 turbojet engines. The maximum speed attained in level attitude flight by an XF-90A was 0.90 Mn (668 mph) with the afterburning J34 engines installed. XF-90A number one achieved a maximum speed of 1.12 Mn (830.4 mph) on May 17, 1950, during one of the last of fifteen dive tests flown by Tony LeVier with its afterburning J34-WE-15 engines. On May 24 and June 28, 1950, the first of the two XF-90A airplanes (46-687) was involved in two separate mishaps. The first of these was a landing accident where the nose landing gear collapsed at Edwards AFB with USAF test pilot Capt. John C. Newman at the controls. The second accident, also at Edwards AFB, saw Lockheed test pilot Thomas V. “Tom” Gibson at the helm of XF-90A number one when an engine fire caused him to make a forced belly landing. The new Lockheed XF-90 jet penetration fighter is a heavyweight slugger combining speed, range and maneuverability. Designed to fly and fight deep within enemy territory, seeking out specific military objectives or targets of opportunity in the air and on the ground, the XF-90 is a sweptwing, needle-nosed airplane using two turbo-jet engines relying on speed and maneuverability to avoid trouble. Although it is a single-seat fighter, the XF-90 is almost as heavy as the familiar DC-3 (C-47) transport plane. Its appearance presents a striking departure from earlier Lockheed aircraft. The 40-foot wings sweep back from the fuselage at a streamlined 35-degree angle, with rudder and elevator surfaces swept back comparably. The single cockpit is located well ahead of the wings for visibility. Into it were built many cockpit installation features developed by the Joint Cockpit Standardization Committee, with the general arrangement coming in for intensive study by pilots and technicians. Every precaution was taken during the design of the XF-90 to make it as invulnerable as possible to battle damage, since the nature of its mission requires it to operate far behind enemy lines where it would be subject to heavy punishment. Simplified maintenance was highly sought-after and problems of producibility were also taken into account in the design of the XF-90, with the result that in spite of its heavy structure the airplane readily lends itself to assembly-line production. Extensive flight test data was obtained through use of six steel and plastic models of the XF-90, which were dropped from high-flying aircraft and studied by radar and radio-recording as they plummeted. The XF-90 has conventional landing gear and incorporates a pilot ejection seat. It is equipped with cabin pressurization and air-conditioning. With the limited power available, the XF-90 proved to be too heavy and too slow, though its sleek design was deceptive. Tony LeVier was forced to point its nose straight down in near ninety-degree full-power dives to make it go fast—this was unacceptable. The XF-90’s general performance was very poor. It wasn’t a hell of a lot better with afterburner. The plane would have had a good chance for success had it had good engines, which it didn’t. The aircraft was the only one in the competition that met USAF specifications in regard to structural strength [it was stressed for 12.5g], so it was much heavier than the other two contenders. The XF-90 was the just the third [combat fighter-type] plane in the world to dive supersonic. The plane was also strong as hell, you could not overstress it in flight. With two afterburning, 4,100 lbf J34-WE-15s (providing 8,200 lbf maximum power in afterburner), its final propulsive system didn’t offer enough power to propel this airplane to supersonic speed in level attitude flight; it simply weighed too much, at some twenty-seven thousand pounds during a flight test. In fact, just to get off the ground, it often had to use four 1,000 lbf Aerojet General twelve-second-duration assisted takeoff (ATO) units. During flight testing, LeVier dove the airplane on fifteen different occasions; he ultimately hit a maximum speed of 1.12 Mn on May 17, 1950. To address its inadequate performance, Lockheed offered up several F-90 derivatives: (1) Model 190-33-02, powered by two afterburning Allison J33-A-29 turbojet engines; (2) Model 290-34-03, powered by two afterburning Westinghouse Electric 6,100 lbf J46-WE-2 turbojet engines or two 4,900 lbf Westinghouse J46-WE-32; and (3) Model 390-35-02, powered by a single afterburning General Electric J47-GE-21 turbojet engine. The USAF rejected these proposals and cancelled the F-90 program. Only one XF-90, the second, survives today. It awaits restoration at the National Museum of the United States Air Force in Dayton, Ohio. It was rescued in 2003 from Frenchman Flat in Nevada, where it had been exposed to fallout from nuclear weapons testing. The first example of this plane was purposely destroyed during static structural strength tests at the NASA facility in Cleveland, Ohio. They’re all here–every X-bomber and X-fighter since 1942. On October 2, 1942, the Bell XP-59 Airacomet soared up and away from present-day Edwards AFB, launching the US Army Air Forces into the Jet Age. In the several decades since, hundreds of new variations of experimental and test turbojet-powered bombers and fighters–X-bombers and X-fighters–have taken explosive flight. These aircraft blazed a trail leading to today’s B-2 Stealth Bomber and F-35 Joint Strike Fighter. The Big Book of X-Bombers & X-Fighters showcases all of the USAF jet-powered X-bombers and X-fighters that have flown since 1942–more than 90 in all, including the alphabet soup of their variants. From experimental to prototype service bombers and fighters–from the XB-43 to the B-2A and the XP-59A to the F-35A–they’re all here, with their inside stories revealed. Some of these aircraft were further developed. Others were canceled. All stretched the performance and design envelopes. More than 250 photos illustrate all of these experimental aircrafts’ cutting-edge features and zeroes in on histories of their design, flight testing, and weapons testing. Specification tables detailing performance, design, and armaments help round out this compendium of information on truly groundbreaking aviation designs. Steve Pace is a freelance aviation history writer, a contributing editor to Flight Journal, and the author of numerous articles and short features on a variety of aircraft and related subjects, as well as thirty aviation history books, including The Big Book of X-Bombers and X-Fighters (2016). He was raised in Seattle, Washington, where his father worked at the Boeing Airplane Company for more than thirty years. As the son of an aircraft builder, he became interested in aviation at an early age – instead of buying candy and marbles, he bought model airplane kits. Pace now resides in Tacoma, Washington.